Manufacturing – C&M Manufacturing Corp.
C & M Manufacturing is a contract stamper with capabilities to 450 tons. We have both OBI and Straightside presses. Each press line is monitored with load analyzers and die protection equipment to aid in detection and prevention of non-conforming product. Our in-house tooling department builds and maintains all our dies; keeping costs lower and improving uptime. Secondary processes include assembly and welding (mig or resistance). All cells are designed with flexibility in mind; most products have a limited life span, the work cells should not. Our processes are verified thru electronic means or thru the use of poke methods; this assures our customers product streams. Lead times vary from as little as two weeks to sixteen weeks from start to PPAP. Quotation process is typically 1-5 days. First and foremost, C & M Manufacturing is a contract stamping facility. We start by quoting from drawings of parts, including tooling, to produce quality stampings, to customer specifications. Low volume and high-volume stamping are both welcome at C & M. Depending on the customer, annual volume, and length of the project, C & M can provide tooling options that provide superior quality, function, and speed to market. Some tooling options can provide hard tooling for prototype, as well as support production; part geometry dependent. Progressive and compound dies are both utilized at C &M Manufacturing, with tonnages up to 450 tons. Production volumes and part geometry are the main, determining factors of the appropriate stamping process/tooling arrangement. Some part geometries require compound die inserts, those that have high concentricity, flatness, or low volumes are generally a good candidate. Other parts have more complex geometries, multiple bends, or require multiple cavities to support high volumes, these are better suited for the progressive die approach. Still other parts, have complex geometries that require a hybrid tooling approach, many examples have been successfully tooled at C & M to support our customers. Process development is key the stamping process. Monitoring is key for the long-term production of defect free stampings. All presses are equipped with tonnage monitors, as well as a variety of in-die monitoring devices, such as probes and electronic switches. Die sensors aid with detection and removal of defective material from the production stream. Short feed, end of stock, feeding equipment jamming, broken taps, and broken die details are all examples of potential incidents that C & M can detect with the properly employed sensors within the press and the tooling. Load analyzers, not only detect overloads, they are also a tool, used for set-up verification. Known stamping processes, should repeat with each set-up and lot of material. Sometimes, minor raw material defects can be detected, due to hardness variations or thickness changes; these are detected and quarantined for disposition. 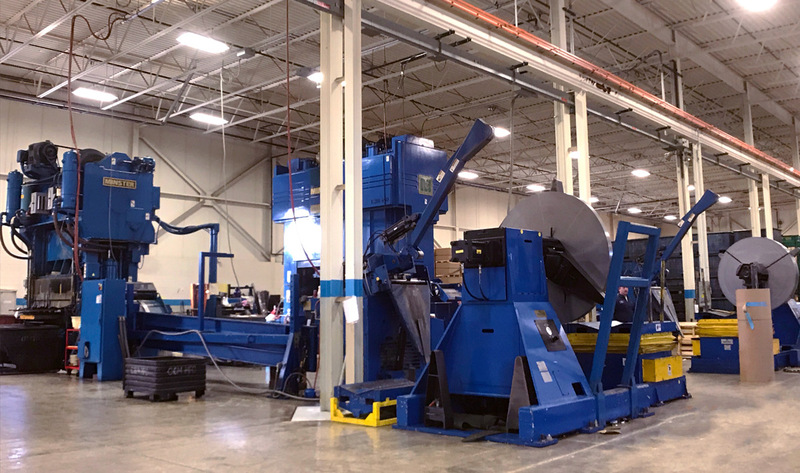 Damage to presses are also minimized, as the range of tonnage for each job is carefully paired for the appropriate tonnage press. Light assembly has always been part of C & M Manufacturing’s competencies. Secondary processes include staking, bending, forming, and welding. Assembly of bolts or pins in a stamping, can be done with utilizing a secondary process or with a highly automated, bowl fed system, inside a progressive die. This process is generally considered a staking operation; forcing the bolt into the stamping, fused together with pressure of interference. Other assemblies can consist of several components, which get kitted, riveted, bonded, or welded together for a full or sub-assembly. These are generally a highly engineered product, which would require an assembly process with a dedicated assembly cell. C & M can manage the design and building of these processes, with the intent of running the production to support the customers’ weekly needs. Poke-Yoke principles aid in the throughput of quality product. 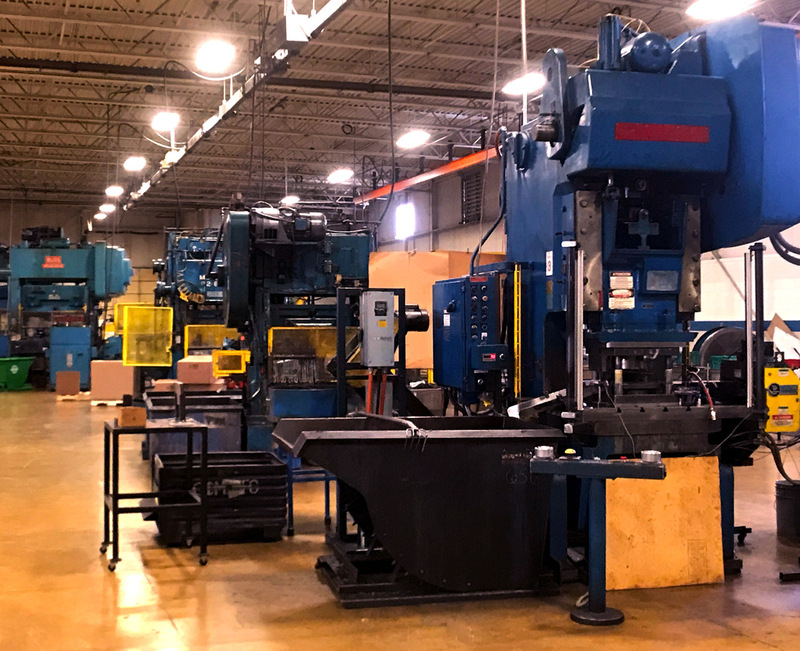 C & M Manufacturing has the ability to weld, in-house as well as manage sources that utilize mig welding, robotic mig welding, spot and compression welding. Examples of welding are as simple as projection welding of nut or bolts, multiple component welding of engine or motor mounts, or no leak assemblies for over molding. C & M can manage the entire project, to aid in the process refinements to “net” a targeted finished fit and functional product. Heat and welding can cause movement in stampings, with our attention to detail, we can adjust our process controls to predict and correct heat stress induced dimensional concerns. C&M believes in our operators, many of our operators have years of experience and are fully capable of using the proper tool and instruments for product inspection. All of our gages and inspection equipment is part of our internal calibration system, equipment that may require calibration beyond our Laboratory Scope is contracted to reputable service firms at intervals based on usage. We have an in-house lab equipped with a Mitutoyo CMM and Starrett Optical Comparator with recently updated software. Third party, outside inspection services are also available. Our processes do include in-press inspection of key dimensions or characteristics at given intervals and frequency’s specifically designed from Process Control Plans. Product and Process Auditing and verification from our Quality Team is an important output to monitor our company’s quality levels and results are reported at our daily “Fast Response Meetings.” C&M’s product is fully traceable from raw material to finished product, unique number sequencing assures each lot is controlled. Our industry standardized Bar Code Labeling incudes this unique number even after it is shipped to our customer.